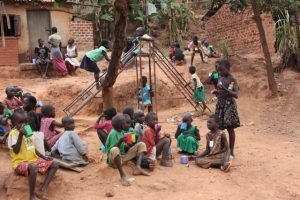 The start of February in Uganda is a significant time for young people, and for the children in Acholi it is no different. The first Monday in February marks the start of the new school year. So whether the child is starting school for the first time, or moving up to a new year group, or transitioning from primary school to senior school – it is a time of hope and anticipation. For some children, it might also be tinged with disappointment, as they have to re-sit their previous year having failed to make the required grade to be promoted to the next class. As a result they will have to make new friends, and live with the knowledge that their previous friends are progressing through school ahead of them. That’s tough to handle, but it’s the way it is, and for those who suffer the experience one year, it often acts as a spur to work harder and ensure it doesn’t happen again. Of course not all of the students will have failed for want of trying – some of them might have an undiagnosed learning issue – poor eyesight, dyslexia etc – and for them the repeating of a year is a further layer of frustration that they already struggle with on a regular basis. 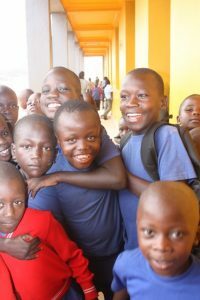 We can only hope that gradually the Ugandan education system will get better at identifying and helping those with additional learning needs, so that the education system becomes more accessible to all. But for the majority of the children, returning to school is, as said, a time of hope and anticipation, and I know that the children in Acholi Quarters who get to go to mainstream school, they are certainly very excited about the new opportunities coming their way. Returning to school also has some other benefits as it means that they will get their daily school lunch again; for many of the Acholi children this is a lifeline, and its absence can be a sore loss during the holidays. Thanks to a number of regular donors, CRED is able to provide financial support for 20 children to go to school. Some of these are total orphans, some are single orphans, but all are linked in some way to the Lubanga Ber co-operative that we do all of our Acholi support through, and all are children that the Acholi ladies have identified as being most in need of support and potential. Three of the children are now at senior school, which in each case is the first time that a child of that family has gone to senior school. In the past the highest grade reached has been top primary, and positive impact of this on the wider family is not to be underestimated. Of course there are many more children who would love to go to mainstream school. Some of them – 40 in fact – are attending the Hopeful Haven – a ‘transition’ educational day care that CRED helped to initiate as a result of a request from the local community. Each of the children attending hopes that one day they will be able to put on a school uniform and walk with the other children to the mainstream school, but in the meantime, by attending Hopeful Haven, they are getting the opportunity to learn basic numeracy and literacy, as well as social skills, handwriting, and good behavior, so that if and when they do get to go to mainstream school they are better able to fit in and comply with expectations. 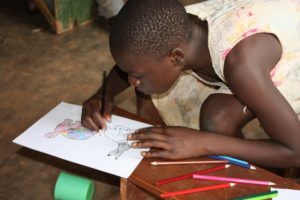 If you would like to help that dream come true for a child in Acholi Community, then please contact Helen to discuss further: Helen.harrison@cred.org.uk. And in the meantime, may your February be a time when you also feel hopeful for the future, just like the Ugandan children. Ellilta – Prevention Program Update.